They ain’t pretty no more. The mashed up fruit in my must. The larger, more intact pieces have floated to the surface. The pectic enzyme and a couple punch downs should break these up within a day or two. 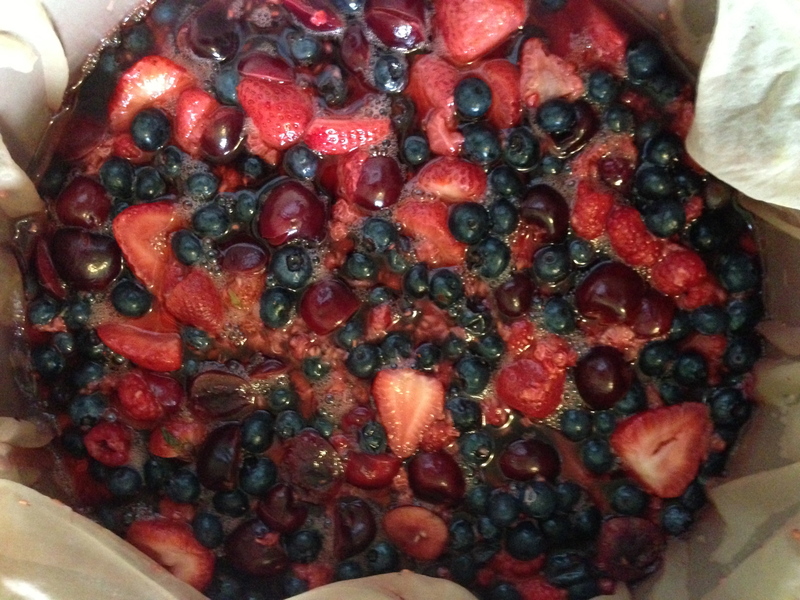 Here’s my mixed fruit country wine recipe. 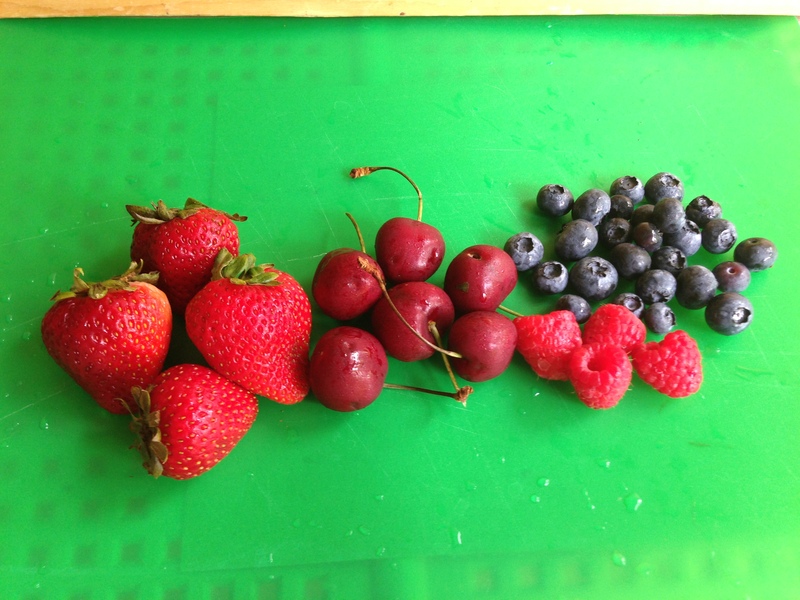 The mix of fruits was determined by a sale at my local supermarket; the proportions of each were based on published recipes. Mash up fruit, add grape concentrate, dissolve sugar in water and combine to make 3.5 gallons of must. Add tannins, acid and pectic enzyme, then stir in 3 (crushed) Campden tablets. The next day, add 1/3 of the yeast nutrient and add the (rehydrated) yeast. Allow to ferment at room temperature. Add second 1/3 of yeast at peak of fermentation (next day?). Add final 1/3 the day after that. I think I’ll let it ferment out to dryness, then maybe backsweeten it to semi-sweetness. I don’t want it to be like boozy fruit punch, but I think a little sugar will improve the fruit flavor. 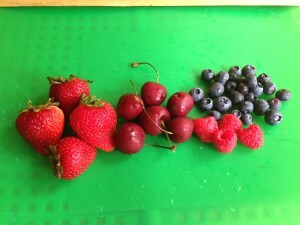 Mash up fruit, add grape concentrate, dissolve sugar in water and combine to make 13 L of must. Add tannins, acid and pectic enzyme, then stir in 3 (crushed) Campden tablets. The next day, add 1/3 of the yeast nutrient and add the (rehydrated) yeast. Allow to ferment at room temperature. Add second 1/3 of yeast at peak of fermentation (next day?). Add final 1/3 the day after that. I think I’ll let it ferment out to dryness, then maybe backsweeten it to semi-sweetness. I don’t want it to be like boozy fruit punch, but I think a little sugar will improve the fruit flavor. Mini update: I sanitized a potato masher and rehydrated the EC-1118 yeast. I punched down the fruit with the potato masher. The fruit pieces still looked fresh — probably because the sulfites from the Campden tablets are keeping things from oxidizing — and hadn’t turned to mush yet. The must smelled strongly of berries. I pitched the yeast and swirled it into the must a bit. So far everything seems to be going well. Any updates on this? The recipe sounds quick and easy. The fermentation has slowed to a crawl now. I did punch downs the first four days and it smelled strongly of berries and had a deep red color. I’m going to transfer it into a carboy in a few days and I’ll post a comment here when I do. Whatever happened with this wine? Did you bottle yet? I would be interested in what you decided to do as far as sweetening goes. I’ve made a blackberry wine and I’m bottling up a mint wine in the near future. One note on the pectic enzyme, I’ve read that you should not added the pectic enzyme and campden at the same time, as the campden will inhibit the pectic enzyme action. I think I’ve read that you should wait 12 hours after campden addition before adding the pectic enzyme. Note, this is based on my internet trolling and not on proffesional expertise! It’s still in the fermenter. I sort of forgot about it. I need to either rack or bottle it soon.